I'm serious, this conference is like a two day, one track, SXSWi. There were great talks (and not all of them were in the conference hall itself), great food, great parties. Much like SXSW, I left the event feeling totally energized and ready to go out and DO stuff. The theme was "Human Circuitry" and I certainly felt plugged in. The most emotionally charged talks were Sarah Lacy's talk on the state of blogging and Scott Maxwell's Mars 3.0 presentation. The blogging talk had a bunch of tension in the room for reasons that really are not that clear. The Mars talk was one of the coolest, most hopeful things I've seen in years. Mars is cool. I have a special warm spot in my heart for that cold dry planet. Back in 1976 my father worked on NASA's Viking project to put two landers on Mars. 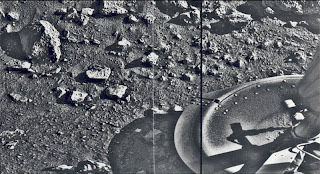 I was a little kid sitting in an auditorium waiting for the very first picture after the Viking 1 Lander touched down in western Chryse Planitia. When the first lines of that picture rastered out across the screen the crowd, quite literally, went wild. While not at that level of electricity, the standing ovation that Scott Maxwell received was most assuredly well deserved. Matt Hartley posted his Top Five Gnomedex Tips which I think should be retitled Top Five Conference Tips. Number two is "Stop Twittering every so often and listen." The twitter army was out in force and I felt from time to time that it was rather impolite to the presenters to see a sea of the backs of laptop screens. Looking around I'd say that at any given time about half the people were heads down typing away. If the talk was boring I assume they were browsing for something more enterataining. If the talk was electrifying I assume they were blogging/twittering/noting that, "Wow, this is great." It seemed like a waste to me. Entrepreneur Mark Bao did a great two person panel with Francine Hardaway (Chris Pirillo served as a kind of moderator and straight man). Mark posted some great observations about speaking and networking at Gnomedex. I got to talk to Mark at the pre-registration party on Thursday. He's a great guy and his blog is definitely worth reading. Like many others at the conference, I'm really glad to have met him. Those were the high points for me. The internet connectivity the first day was pretty spotty. So if you're really relying on having a solid connection get an EVDO or something like that. Overall my first Gnomedex was a great experience. Will I be back next year? Damn right I will! I'm guilty of tweeting from the conference. I followed "Gnomedex" to add real time commentary to the talk - make it more of a conversation. In some cases, it really added a lot - someone would toss up a link to the speaker's paper or grab a quote that I wanted to save for later. I never used it to go looking for something more interesting because I was bored. One, because I wasn't bored, and two, because that would be just rude. The problem becomes: how can the speaker tell when you're twittering to add to their talk, or when the audience is surfing the web and not paying attention? You can't really, everything just comes off as impolite. So, even though it added something, I've decided in the long run I'd agree that it would have been better if we had all just shut our screens and broke them out for breaks only. Plus, sometimes you're so busy capturing a moment digitally that I feel like we do less actual processing of it.